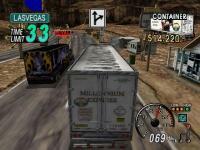 18 Wheeler: American Pro Trucker review Game Over Online - http://www.game-over.com Sega has granted the rights to publish old Dreamcast titles on present-technology consoles to Acclaim, and 18-Wheeler is one of the many products of this partnership. When this game was originally released on the DC almost a year ago, it was greeted with a luke-warm reception thanks in part to its lackluster depth and short life span. So why, you may ask, was this game ported to much more powerful systems like the PS2 and NGC? In short; to make a quick buck. And while this is a faithful translation of the original game, it still suffers from the same annoyances found in the DC version. This game was lacking on the DC and its faults are even more apparent with this GameCube release. Visually this game looks nearly identical to the original DC version and does little to add to the overall aesthetic value of the experience. There are two different views while you are driving; one from the driver’s seat and a 3rd person view. The draw-distance is seriously lacking and not being able to see farther than a few meters in front of you at any time can be very distracting. The lack of graphical enhancements in the game just reaffirms the fact that this is a rehashed, out-of-date, port. Add it to the pile of stagnant titles being re-released over multiple platforms. Music consists almost entirely of stereotypical country/rock tunes that do little to mediate the dull and drudging gameplay mechanics. Aside from the lackluster tunes, you’ll also be treated to constant comments on the part of your rival. While this does add a sense of style to the game, it gets old very quickly. 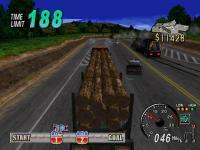 18-Wheeler is based on the original arcade game of the same name, but without the use of the sit-down arcade cabinet there is little substance left to keep you entertained. You’ll play the part of a trucker whose responsibility is to deliver payloads from point A to point B across various locations throughout America. 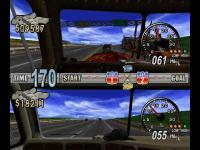 You will have the option to choose your trucker out of four unique characters but regardless of which person you choose, they’ll still play nearly identical. You’ll have to contend with multiple obstacles on your trips like the constantly counting down clock, a hurricane, and the rival trucker named Al whose sole purpose in life is to provide annoying commentary and attempt to ram you off the road. Ramming into certain vehicles will extend your allotted time by 3 seconds; this will be necessary in progressing on certain levels. Another useful tactic to preserving time is to get caught in a ‘slipstream’, which can be performed by driving behind trucks and using them to break the oncoming wind that usually slows you down. You’ll have to use all the strategies at your disposal to finish a race since even the slightest mistake can potentially result in failure. Aside from the standard Arcade mode previously described, you’ll also have the option to play Parking Mode. 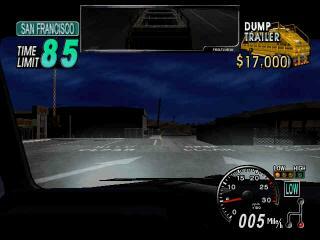 In this mode you will be challenged to navigate your big-rig through obstacles and successfully park your truck. 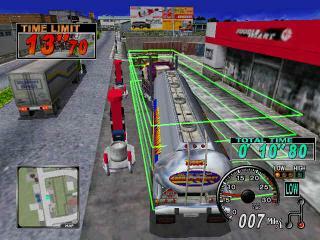 There is also a Score Attack Mode which has you running around a course for three laps avoiding potential dangers and attempting to beat the rival trucker to the finish line. 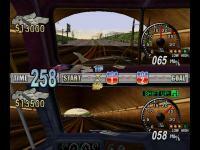 A Versus Mode is included and through the use of split-screen you’ll be able to race against a human opponent. 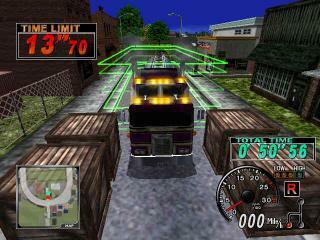 Controlling your 18-Wheeler is for the most part slow and unwieldy. Getting up to a respectable speed requires a counter-productive amount of time and negotiating turns through busy streets can be very frustrating. It should be noted however, that despite the sluggishness of the control, 18-Wheeler does do a good job of emulating what its like to actually drive a big-rig. 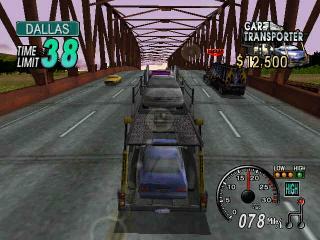 Unfortunately, true-to-life 18-Wheeler dynamics do not add up to an enjoyable video game experience. 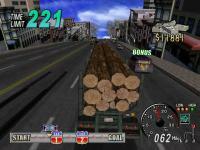 Sega has granted the rights to publish old Dreamcast titles on present-technology consoles to Acclaim, and 18-Wheeler is one of the many products of this partnership. When this game was originally released on the DC almost a year ago, it was greeted with a luke-warm reception thanks in part to its lackluster depth and short life span. So why, you may ask, was this game ported to much more powerful systems like the PS2 and NGC? In short; to make a quick buck. And while this is a faithful translation of the original game, it still suffers from the same annoyances found in the DC version. This game was lacking on the DC and its faults are even more apparent with this GameCube release. Considering the fact that 18-Wheeler only offers around 3 hours of game time, it should come as no surprise that I do not recommend this game outside of a one-night rental. Even then you’ll probably be bored with the game after only your first time through. 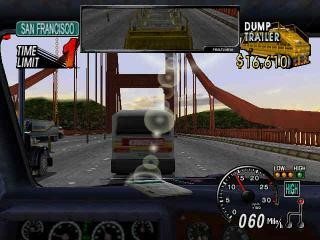 After racing through five different locales and hearing countless taunts from the rival trucker, you’ll be more than ready to put this game away and not think about it again until 18-Wheeler is re-released on the PS3 in 2007.